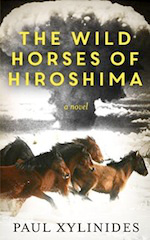 The wild horses in The Wild Horses Of Hiroshima (240 pages) are certainly intriguing, as with the title and cover art, and play a strong role at the story’s end by appearing in the streets of Hiroshima to wander about as a healing force, cared for by the citizens. They derive from the imagination of a novelist who is also a character in the novel, who is also creating a narrative. The horses seem to emphasize purity and nobility, pounding through the city in herds, a shield against nuclear war and against the violent nature of the human species itself. This novel inside the novel begins approximately half way into the story, following a background beginning with the atom bomb attack on Hiroshima and its hideous devastation. A young American man has been a penpal with a young Japanese girl, and after the war, he goes to Hiroshima to find her. They marry and move to New Hampshire, bearing a son, Yukio. Yukio becomes a strong, husky young man who survives the attack of a bear which kills his father. He and his mother, Miyeko, return to Japan where he becomes a sumo wrestler. Time passes and he retires to write novels. The novel within a novel begins, with occasional returns to the exterior story of Yukio and his mother, plus Yukio’s geisha, Satoko.